The Front-Runner hydrofoil is a full-size watercraft pulled by two 215 horsepower jet-drive engines. This design is strikingly similar to that of the podracers in Star Wars: The Phantom Menace. The Front-Runner concept was unveiled by Joey Ruiter, design principal of JRuiter Studio, at the 62nd Annual Grand Rapids Boat Show. 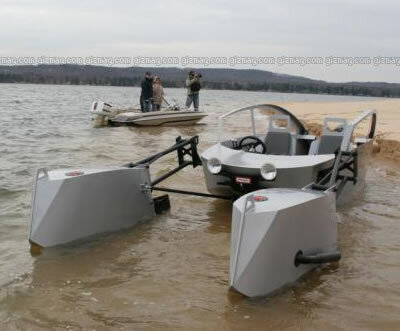 The two motors are attached via an airplane-like steering system; it creates what has been described as an "off-roading" experience on the water. The two engines can be independently steered; heading, pitch and bank can be altered. the use of twin forward-mounted motors combined with the suspension system enable the Front-Runner to pierce the water and carve in and out of turns. The rear hydrofoil lifts the boat body out of the water so the driver can control different aspects of the ride. This design changes the rider’s experience – having the motor in front of the bow produces more of a “pulling” sensation compared to the “pushing” feel of a traditional boat and the twin supercharged 215 horsepower motors provide ample power for a small craft. This watercraft design is remarkably similar to that of the podracers in Star Wars: The Phantom Menace; Anakin Skywalker's podracer is shown below. 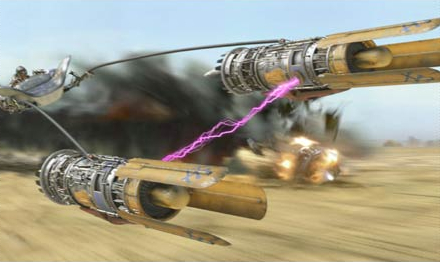 In the movie, Anakin's vehicle is smaller and lighter than the others, but follows the same design; a small cockpit pulled by two high-powered jet engines. Anakin is the only human able to drive this extremely fast, extremely dangerous craft; apparently, humans find the Front-Runner hydrofoil easier to operate. Via Gizmag; thanks to Vik for another contribution.